Michael Cohen, President Trump&apos;s former personal attorney, ended his testimony before the House Oversight and Reform Committee. This week, the son of a Holocaust survivor sat before Congress and testified about how he had helped install a white supremacist “autocrat” as President of the United States. Nothing better illustrates the liminal position in which American Jews find ourselves now. We have witnessed a powerful resurgence of anti-Semitism that has infiltrated both places of power and the public square. We’ve seen it marching through the streets of Charlottesville, slaughtering 11 people in a Pittsburgh synagogue, and snaking from the mouths of politicians and elected officials in the current administration. Yet even as white nationalists wish us dead, a shocking number of Jews have become willing collaborators in white supremacy — not only public bigots such as Ben Shapiro and David Horowitz, but kapos in the openly ethnonationalist Trump regime, such as Stephen Miller or Jared Kushner. Thus we are capable of being both the target of racism and a part of its apparatus. That could not be clearer than in the tragic figure of Michael Cohen, Trump’s longtime fixer. In his opening statement to the House Advisory Committee this week, Cohen made a point of mentioning that his father, Maurice, had survived a concentration camp before immigrating to the United States. Cohen went on to describe, with understandable irony, the decades he spent enabling the rise of a “racist” — Cohen’s word — who used xenophobia to consolidate his power, and tore apart families to put children of immigrants seeking asylum into camps. “I let you down,” he said, addressing his father. Maybe he was talking to all of us. 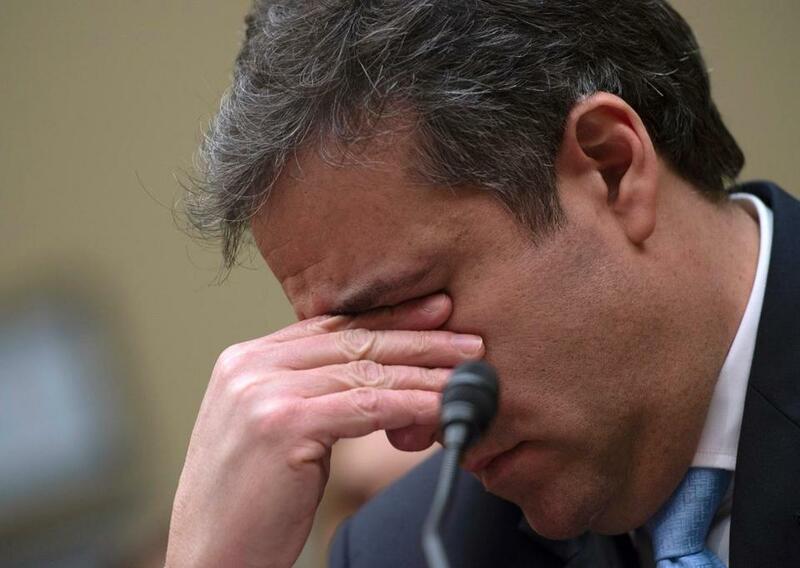 On the stand, Cohen wasn’t the sad-sack schmendrick we expected from his perp walk photos. Instead he was uncomfortably familiar — another striver hungering for power, money, and affirmation. In his life, Cohen chose one of the oldest minority survival tactics — assimilation into white supremacy and its agendas. The essence of this strategy is collaboration, capitulation, and cowardice. It’s the hope that when they’re rounding people up, they’ll come for someone else first, and maybe never get around to you and yours. Maybe you can even slow that progress by rounding people up yourself. In doing so, Cohen was following in the footsteps of Roy Cohn, Trump’s old mentor. Cohn had been Joseph McCarthy’s right hand in the Red Scare witch hunt of the 1950s, the lawyer who helped send Julius and Ethel Rosenberg to the electric chair, a gay Jew who sold out Jews and homosexuals without a second thought. Like Cohn, Cohen was willing to cozy up to the racism of those he sought to serve. Growing up on Long Island, Cohen had been a Trump stan since high school. Trump’s bigotry was already obvious then — it runs all the way back to the 1970s when the Department of Justice took him and his father to court for discrimination. Perhaps that very bigotry was part of Trump’s allure for Cohen. In 2001, Cohen began investing in Trump properties and convinced his own family members to do so too — literally buying his way into Trump’s regard. By 2011, Cohen — who at 22 had volunteered on Mike Dukakis’s 1988 presidential campaign — was an executive in the Trump Organization and had become known as Trump’s “pit bull.” It was actually Cohen’s idea, that year, to start exploring the possibility of a Trump presidential run. Cohen continued to cover for Trump — even assembling a “diversity coalition” to give his boss’s xenophobia plausible deniability — right up until the end. But just as Trump dropped Roy Cohn when Cohn got AIDS (“Donald pisses icewater,” was Cohn’s judgement on his former protegé), he had no compunctions about treating his new fixer with contempt, barking at him in front of others, and playing him off against other retainers. Rather than a pit bull, the New York Times called Cohen Trump’s punching bag. On June 20 — six weeks after the FBI raided his office, and five days after Trump publicly disowned him, refusing to pay his legal fees — Cohen began to display something like a conscience. He resigned as deputy finance chairman of the Republican National Committee, reportedly citing a conversation with his father as a turning point. Maurice Cohen reportedly told his son that he hadn’t survived the Holocaust just to see the family name “sullied” by Trump. He could easily have been addressing his fellow Jews. Cohen’s collaboration with a racist regime was simply a more extreme version of the same deal so many light-skinned Jews make with white supremacy. Even those of us who consider ourselves liberal or progressive can be deeply ambivalent about the conditional whiteness bestowed upon us in the United States over the past 60 years. We work in the all-white office and we never point out that it’s all white. We move our children to a whiter school — not because we care about race, we say, but because education is so important. We laugh at the racist joke. We hedge our bets. White supremacy is a protection racket; it offers security on one hand and a lethal threat on the other. Other minorities make this bargain too, sometimes — look at Ben Carson and Clarence Thomas — but Jews more easily succumb because so many of us easily pass as white. Note that this strategy has never worked for us. It didn’t protect us in Spain, or England, or France, or Germany. There’s no reason to think it will work now. And it certainly did not work for Cohen. At the heart of this moment is the question of how we survive as a minority population. As history curves in on itself, as fascism repeats itself, we have only one advantage: unlike other places where ethnonationalism has flourished, the US is fast approaching a plurality of minorities. Coalition is white supremacy’s worst nightmare — that’s why so many white supremacists are fighting so hard against it. Look no further than former Republican Maine governor (and proto-Trump) Paul LePage, who the day after Cohen’s testimony publicly defended the electoral college on the basis that it keeps minorities from having an equal vote. A rising tide of racism drowns us all. White supremacist fears of a majority-minority nation don’t target any one group alone — they are interconnected, as we saw when anti-immigrant xenophobia fueled the killings of Jews in Pittsburgh. If Jews are going to survive the future, we will have to stand with people of color for our mutual benefit. In the final moments of Wednesday’s hearing, Representative Elijah Cummings — the black son of sharecroppers — preached a sermon of redemption. Standing before him, Cohen wept.